As part of the Liberator trade paperback, Black Mask Studios asked a stellar team of comic creators to play in the world that Matt Miner created. Each team had the chance to create a short story using characters and ideas already explored in the first volume of Liberator, adding to the world and further looking into animal activism and rights. The collected issues combined with all the backups make the Liberator trade a huge collection of comics with a cause. All week long on StashMyComics we’ll be talking with some of the contributors to the Liberator trade, like Ales Kot, Fabian Rangel, Jr., Brian Level, and, of course, Matt Miner himself. Check out all the previous interviews here. Today’s interview is a big one and we talk with Adam Egypt Mortimer, writer of Black Mask’s Ballistic and artist Ryan Lee, whose art you may recognize from a recent Ghostbusters variant cover. 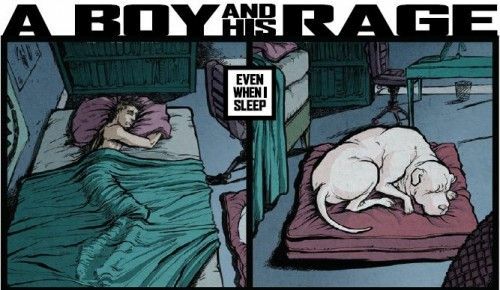 The team contributed the story A Boy And His Rage, centering on Damon, one of Liberator’s primary characters. Ryan Lee: I did a Liberator pin-up for Matt a few issues back and I think he liked it. Adam Egypt Mortimer had a great script that Matt thought I’d be a good fit for for the trade and everything worked out perfectly. Adam Egypt Mortimer: The first slate at Black Mask was a small one – there were just a few creators working closely with the studio partners to get these things launched. In particular, I think Miner, Rosenberg and myself all feel lucky and proud to be a part of studio and we all have a sense of wanting to help build this thing as a creative collective. we’re all in touch with one another, we ask each other for help, and Matt Pizzolo, the coffee-fueled ring leader slash mastermind, is in constant and hyperactive contact with each one of us on a daily basis (to his horror). He asked me if I wanted to contribute a story and I was psyched by the opportunity – both because I wanted to get to play with Miner’s toys and because I wanted to help facilitate the idea of Black Mask as a shared creative experience. LJ: You contributed the story A Boy and His Rage. What’s it all about? RL: Adam could probably break it down for you more eloquently, but I’ll give it my best shot. It’s a story showing the similarities in the nightmarish pasts of Damon and his rescued dog, Justice. Through their companionship they’ve found comfort and understanding due to their parallel experiences. AEM: It’s such a short story that it would probably take more words to summarize it than it took to write the script for Ryan. It explores the deep and intense connection between Damon, the hero of Liberator, and his pit bull Justice. I was interested in the idea that they have very similar emotional experiences, they both experienced violence and cruelty and they’ve both had the potential to process these experiences into negative, dark identities. Into rage. But there’s something in the connection between them that transforms all that. I love the way that the human-animal connection can create transcendence. Sometimes when I touch my cat I’m a bit awestruck that we’re able to experience interspecies empathy. I was also excited by the idea that there was a relationship between what I’m writing in Ballistic (the connection between a man and his sentient gun) and what I saw in Liberator. RL: Although I am an animal lover (especially dogs), I don’t have any ties to actual activism. Working in the Liberator world definitely raised some startling awareness to the atrocities being performed on animals. AEM: Miner is striking blows against the empire. that’s a crucial thing to be doing now, but most people are afraid to engage. Miner is committed, and i have to support that. RL: Because Matt and this book rule. 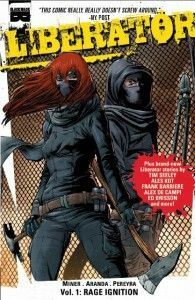 AEM: Liberator does the thing that superhero books have promised over and over but have rarely had to courage to do, which is to show a way in which we can all actually become superheroes. Seriously, this is a comic that shows you how to do that – how cool is that?